Heat a skillet and spray with cooking spray. Add garlic and saute for 1 minute, adding a tablespoon of water of it begins to stick. Stir in mustard greens along with more water, if necessary, and cook until wilted and tender, about 3-4 minutes. Add garbanzo beans and cook until hot. Squeeze half a lemon over beans + greens. Meanwhile, whisk together tahini through hot sauce for dressing. 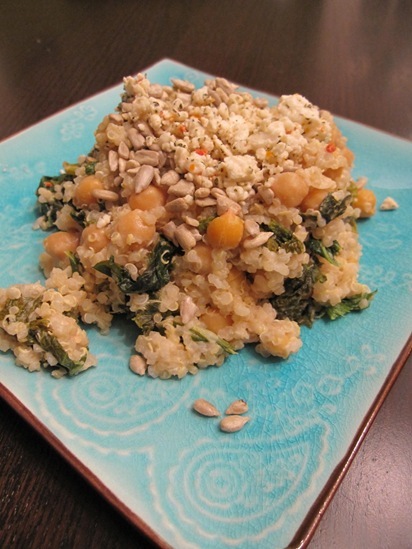 In a large bowl, toss quinoa, hot greens + beans, and dressing. 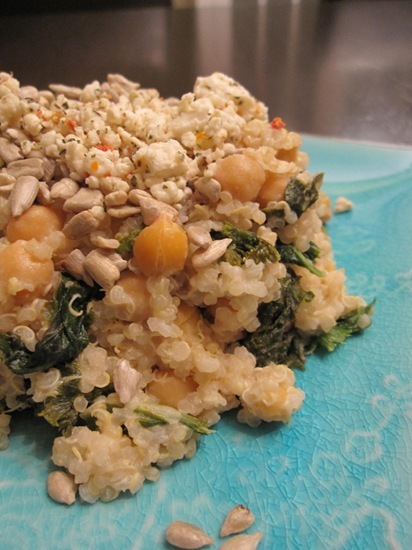 Serve topped with crumbled feta cheese and sesame seeds. Each serving about 400 calories.